Because there are thousands of gun regulations surrounding the buying, selling, carrying, and even using guns, it’s no wonder why you may be asking yourself, “Is it legal to buy a gun from someone?” Although many people do it often, there are a few stipulations that gun enthusiasts who are looking to buy or sell a gun privately should consider. In this article, we’ll address what you should keep in mind when you buy a gun from a private seller instead of a gun shop. First thing’s first. Can you legally buy a firearm? Are you attempting to possess a firearm without a license? Are you a convicted felon? These are all important questions to keep in mind before you buy a firearm at a gun dealer or privately. Gun laws vary by state, so it’s important to know your rights and the requirements for buying a gun. In some states like Connecticut for example, possession without a license could mean up to two years in prison, a fine up to $500, or both. However in other states like Alabama, a license, registration, or permit is not required to buy a gun in Alabama (although a permit is required to carry). In all states, a felony conviction, a conviction of a crime of domestic violence, and a number of other circumstances (click here for full list from ATF) can result in a person being legally prohibited from buying or possessing a firearm or ammunition (“Prohibited Person”). If a felon has been pardoned or the person has their “civil rights restored,” they may be permitted to own a gun. So before you think about buying a gun, figure out what state guns laws are affecting you here. Whenever you conduct a transaction through a private sale, especially when you buy used guns, it’s always a good idea to keep some documentation for your records. When buying or selling a firearm, always make sure you get a bill of sale. Although legally this is not a requirement, it is a best practice for the buyer and seller to both have a copy for their records. In the event that the gun was used in a crime, there needs to be a paper trail documenting when the seller transferred ownership to the purchaser. A bill of sale should contain the names of both parties (buyer & seller), include an “AS IS” disclaimer, and list the make, model, and serial number of the firearm. Whether you know the seller or not, make sure you get a copy of his or her identification and pistol permit if they have one. Take a picture of it with your cell phone and print it later for documentation. This covers you with a paper trail since you have no clue where that gun has been and whose possession it has been in before you took ownership. Also, if at all possible, get the county or city law enforcement to run the serial number on the gun to make sure the firearm is not stolen. If you ever get caught with a stolen firearm, it can be a hassle with the law and can lead to jail time, tickets, court, and the loss of your firearm and money. As you may have gathered, yes it is legal to buy a gun from a private seller; however, if done wrong, it can be risky. If you want to keep the benefits of getting a high quality item for a fraction of the cost, but don’t want to take a chance on a private gun sale going wrong, consider buying from a reputable licensed dealer. There are plenty of reputable pawn shops with a wide selection of firearms to meet your needs. Most pawn shops offer a product protection plan on their firearms in case they stop working properly. 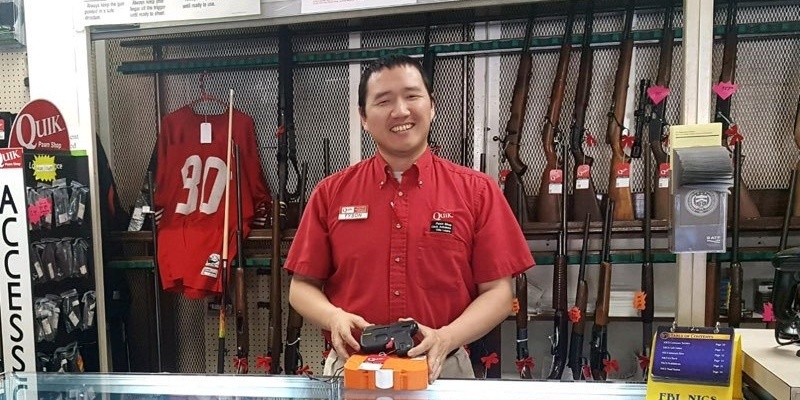 Most pawn shops also work closely with law enforcement, so in the unlikely event that a firearm comes back stolen, they will refund your money or replace the firearm you purchased. You can never go wrong purchasing a firearm from your local pawn shops. Have more questions about pawn loans? We’ve got answers. Quik Pawn Shop in Alabama is a family owned business with a customer first mentality. They do their best to cater to the needs of their customers and help them find what they are looking for at the best price possible. Customers have trusted them for nearly 40 years, and so can you! Looking for pawn shops that buy guns, offers pawn loans, or sells guns outright? Speak to our friendly team at 855-402-PAWN (7296) to get started or click here to find a Quik Pawn Shop near you. Subscribe below to get email notifications with money savings tips, special offers, and updates on upcoming Tent Sales and more.